Bozeman had the guts to cold call us and challenge the DDC to talk. We accepted and got our affairs in order to get out there and LAY WASTE to all in attendance. 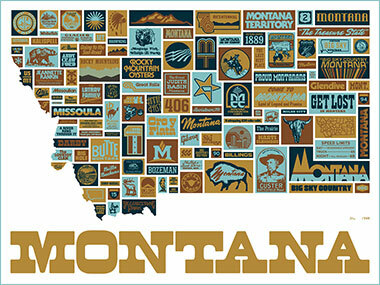 And because we’ve always loved Montana, we made a poster with everything we love about the place. We’ve driven that behemoth from edge to edge, top to bottom, diagonally, and each time it offers a new set of challenges. Hell, one time dad and I, heading Eastbound, took a left turn “up into the mountains” to explore a dirt road. After a bit, the crunchy dirt turns into wet dirt. Then mud. Then you see some snow in the woods. Then some snow on the road. And before you know it, you are in a foot of snow, with big, mean clouds rolling in overhead. THIS IS HOW YOU DIE IN THE WEST. Dumb people, taking dumb roads, and the West will eat you up. Dad made me put that rig in reverse and we got the hell out of there. Anyhoo, thank you Montana, you big beast. Safe, prudent and breathtaking. 01. Printed on thick, uncoated French “Starch Rain” poster stock. Light blue! Hurricane-proof. 02. Four colors! Inspired by Gold, big sky and cowboy denim. 03.24” x 18”! Montana is big, and so is this one. 04. Proudly printed by the Pantoned practicioners of Seizure Palace right here in Portland, Oregon. 05. Get some binoculars on that big game: Not bad, right? 06. The perfect “hit of awesome” for that rustic Livingston cabin, Browning quonset hut, Missoula dorm room, Bozeman design professor office, Butte liquor store, Letterman western getaway, Whitefish lean-to, Glacier National Park ranger station or Havre jail cell. 07. Dedicated to Lovejoy, LaTray, John Robbins and other grizzly bears.